I think there is a bit of fear surrounding risotto, it never seems to appear in "quick" recipe books and always carries the mantle of being a labour of love. 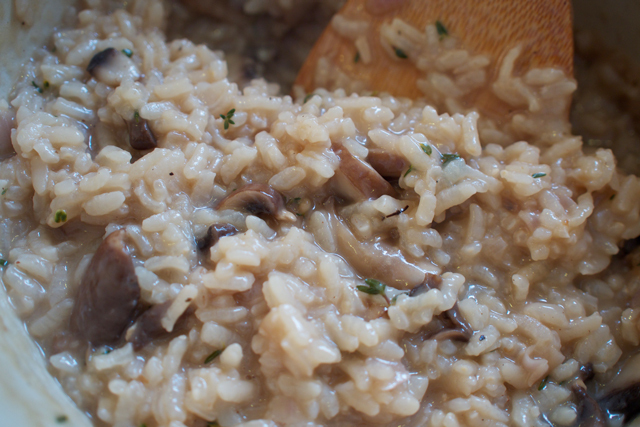 I have never been one to believe in that to be honest, risotto for me is super quick comfort food, and my favourite thing to mix into it is chestnut mushrooms. Woody and rich they add a depth of flavour that is perfectly complemented by the sharp wine and parmesan. A sprinkle of fresh thyme at the last minute brings a spring zing while not being too clean tasting. 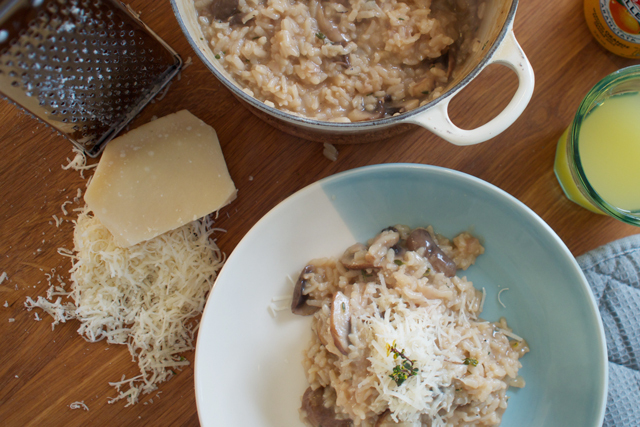 This risotto is easy for a weeknight, it doesn't require watching like a hawk or stirring until your arm drops off. It is warming yet still light enough for a spring or summer evening, and I make it in just under 30 minutes. Half a medium sized onion, chopped. Large block of parmesan cheese. A few stalks of fresh thyme. - Place a large heavy bottomed saucepan on to a medium heat, add a large wedge of butter and drizzle the drizzle the butter with oil. heat slowly under just browned, then add your chopped onion and garlic. Cook until lightly browned. - Begin to heat your stock, either in a pan on the stove or in the microwave as I do as I keep mine frozen. - Add your risotto rice to the onion and garlic and stir until coated in the fat. turn the heat up and add your wine, feel free to add more if you like the flavour, and then wait for a minute or so for all of the alcohol to cook off. Turn the heat back to medium. - Ladle 1/4 of your stock into the rice and stir. leave to bubble away for a few minutes while you slice your mushrooms and grate your parmesan. How much you grate is up to you, I like a lot of parmesan, I also like to add more to the top, I grated enough to be classed as a large handful. - Come back to your risotto, give it a stir and if the stock is all absorbed, ladle in another 1/4. Again leave the pan be for a few minutes, go and strip your thyme stalks of leaves. - Come back and stir your pan, if the stock is almost absorbed, add the next 1/4 of your stock and all of the mushrooms. Give the risotto a really really good stir at this point. The mushrooms will give out some of their own liquid as they cook, so keep an eye on the risotto after another couple of minutes, and add the last 1/4 of stock along with the thyme. - Once the stock has been almost completely absorbed but still a little gooey turn the heat off and stir in your parmesan. Keep stirring until it is all melted. - Dish up and top with more parmesan. Enjoy, and try not to go back for more!